Large SoWal Rental Perfectly Located on South Side of 30A + Short Walk to Beach and Gulf Place Town Center! 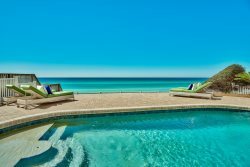 30A Escapes presents... "Absolute Paradise", a true beach retreat! This Florida beach cottage located in the gated community of Sunrise Beach has a private heated pool, spacious balconies and is just a short stroll from the beach access (about 40 yards)! The pool area features a flat screen TV for viewing your favorite team's games or listening to music while enjoying a refreshing dip in the pool. The main living area, located on the second floor has a spacious kitchen with stainless steel appliances and granite countertops. There are two dining tables to seat a total of fourteen and two kitchen bars that offer additional seating for seven! The comfortable living area has a flat screen tv, dvd and fireplace. If you like to dine al fresco, the spacious balcony off the living room has a dining table for six. Or enjoy the gentle breeze on the swing while overlooking the pool. The kids bunk room is also on the second floor. This room has 2 bunk beds, each with a full on bottom and a twin bed on top (total of 2 fulls and 2 twins), a flat screen tv and dvd player. The attached bathroom has a single vanity and shower/tub (this bathroom also connects with the living room). The first floor offers an additional living area with a large flat screen tv, dvd player, sleeper sofa, foosball table and kitchenette. The kitchenette has a fridge, separate ice maker and microwave. There is also a ping pong table in the garage! The guest king bedroom has a flat screen tv, dvd player and attached bathroom with a double vanity and shower/tub (this bathroom also connects with the living area). The pool area is spacious with ample seating for outdoor gatherings, a gas grill and large outdoor tv for entertaining. There are three bedrooms located on the third floor. The master bedroom features a king size bed, flat screen tv, dvd player and a private balcony. The private balcony is a treat with 2 lounge chairs, 2 chairs and a beverage table. The spacious ensuite bathroom has a double vanity, separate shower, jetted soak tub and a spacious closet with a crib. The guest king bedroom features a flat screen tv, dvd player and ensuite bathroom with a single vanity and shower/tub. This room also has access to a shared balcony with seating for four. The guest queen bedroom features a flat screen tv, dvd player, ensuite bathroom with a single vanity and shower/tub and access to the shared balcony. 3) 5 bikes are included in the rental. To utilize, waiver must be signed and received before code provided. Please contact Saxon with Bikes4U at 850.399.1230 with any bike questions. I hosted my best friend's bachelorette party here and it was the perfect escape for us all! The house was gorgeous and had great amenities where we could cook our own food and relax all together. There are a lot of great restaurants within walking distance. Overall I would absolutely recommend this property! Spacious, close to the beach, great amenities, terrific views from the second floor, light, bright, electronics were good, lots of games, ping-pong table set-up is great. You will not be disappointed.